Beginning with the cx-5, grip type front and rear stabilizer bushings have been incorporated for noise prevention purposes. if any type of grease or lubrication is applied to the bushings, it may create noise due to bushing slippage. The skyactiv®-g 2.5t engine requires a unique oil filter (py8w-14-302) which is not interchangeable with other skyactiv® oil filters. the unique oil filter can be identified with two white bands as shown below. Some vehicles may experience the check engine light on with dtc p0171 (fuel trim too lean) and possibly dtcs p030x (misfire). vehicles having this concern should use the following inspection/repair procedure. Some vehicles may exhibit wear/peel-off of the leather steering wheel surface causing a poor appearance.this concern may be caused by an insufficient wear resistance of the steering wheel surface. This information is provided to help address passenger airbag deactivation (pad) indicator illumination concerns during vehicle service. When installing a navigation sd card, the center display may show error message "invalid sd card". Some customers may complain about siriusxm satellite radio does not show album art, artist biographies or station logos in the center display. this is a normal condition. 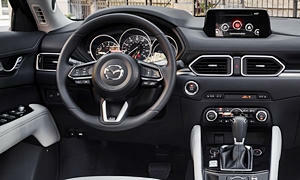 If the mazda connect connectivity master unit (cmu) is replaced due to failure, the replacement cmu may have a navigation system software error. to resolve this concern, after the installation of the new cmu, check the software version. Ids software version 107 available on mgss - please update your pc's. upgrade your pcs to ids version 107.00 and 107.01 from the previous version. An update to the mazda connect system is now available for download from the mazda global service support (mgss) system. the new version number is 59.00.502. please refer to tsb 09-017/17 for a list of improvements to the system. In order to do a cmu data retrieval for the new mazda connect software, make sure to use version 31 (available on mgss). Whenever you are reprogramming a pcm or any other module, always use the gr8 battery charger in the power supply mode to prevent the battery from discharging. The workshop manual has two-different airbag procedures, one for standard deployment and one for two-step deployment. standard deployment is for mexico spec vehicles and two-step deployment is for us and canadian spec vehicles. At pdi or when new vehicle is delivered, some customers may complain about wrinkles on the leather seat cushion and/or seat back surface. Some customers may complain about the mazda connect center display cracking (spider cracking). the cracks are internal and cannot be felt by touch. this may be caused by a faulty center display. If one of the blind spot monitoring (bsm) control modules has to be replaced on a 2017-2018 cx-5, inspect the labels (1) and (2) on the modules (p/n kb8c-67y30e). modules that have an ?a9? label cannot be used with modules that have an ?a8? The mazda mobile start (mms) is currently experiencing a system disruption. user web portal and call center web portal functions are affected. 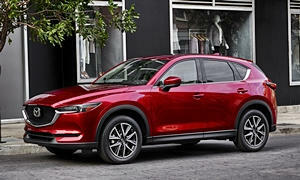 mazda is working on this issue and will notify dealers when mms service has been fully restored. Some vehicles may exhibit a chattering noise from the rear spoiler (a) while driving on a rough road. this may be caused by loose rear spoiler installation nuts. Caution: do not attempt any repair of the windshield damaged by stone chipping/cracks at the area in front of the forward sensing camera (fsc) and laser sensor. replace the windshield with a new one instead. On some 2017 cx-5 vehicles, the drivers door is slightly harder to close than the other doors. this occurs when all the other doors and windows are fully closed. Some vehicles equipped with mazda radar cruise control (mrcc) will not set (the system stays on standby) if the driver's seat belt is not fastened. this is a normal condition. do not perform any repairs for this condition. Raising a vehicle with a jack can be dangerous if not done properly. the vehicle can slip off the jack and seri-ously injure someone. in this service information, some important warnings and cautions have been taken from the owner¿s manual.